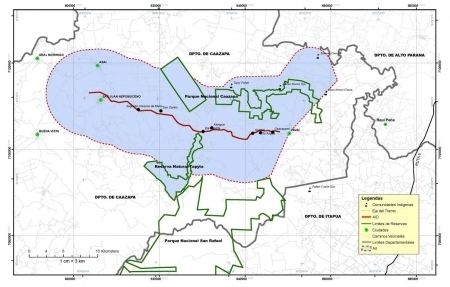 The Ministry of Public Works for the Republic of Paraguay (MOPC), working with the Inter-American Development Bank (IDB) on an IDB-funded project, used INVEST to score a 97 kilometer (km) road project that passes near indigenous communities and wildlife refuges. The MOPC found that their technical specifications on environmental aspects for road projects brought them an increased level of sustainability, but that there was still further to go. In considering ways to bolster the sustainability of the transportation projects it funds, the IDB investigated various sustainability rating systems and requested more information about INVEST from FHWA. The IDB found several features of INVEST attractive for application to IDB-funded transportation projects – it is specific to transportation, follows a project cycle, is free and easy to use, and could be used on projects immediately since it is already available. The IDB approached the MOPC in Paraguay about using INVEST on an IDB-funded road building project. The MOPC agreed to use the Project Development (PD) module of INVEST on the road project to evaluate and improve sustainability. The project is the asphalt paving of a dirt road that runs 97 km (60 miles) from the city of San Juan Nepomuceno to Paraguay’s National Route 6. The project will improve the road to a two lane road with speeds of 80 km per hour (50 miles per hour) in rural areas and 40 km per hour (25 miles per hour) in urban areas. Speed and slope specifications are in accordance with American Association of State Highway and Transportation Officials (AASHTO) guidelines. The project passes wildlife areas, rural farming communities, and indigenous communities. The project is intended to improve access and traffic volume and thus foster socio-economic development of the area. The benefits of the improvement of the San Juan Nepomuceno roadway were calculated mainly from reductions in transportation costs, vehicle operation costs (VOC), and travel time. These benefits apply to normal traffic, derived traffic, and induced traffic. PD-01 Economic Analysis (5/5 points): Paraguay conducted a benefit-cost analysis and an economic impact analysis, as required by the IDB in order to receive a loan for the project. Using a 12 percent discount rate, the $58 million project would save $8 million in road maintenance costs, $14 million in VOC, $16 million in travel time, and produce $62 million in economic development benefits over the course of its lifetime for a net present value of $41 million and an internal rate of return of 19.8 percent. PD-02 Lifecycle Cost Analyses (2/3 points): Paraguay conducted lifecycle cost analyses to quantify the differential costs of alternative investment options for the project throughout the life of the alternatives, including maintenance and operations, not only initial investments. PD-03 Context Sensitive Project Development (3/5 points): The MOPC held meetings with rural and indigenous communities along the route and hired a biodiversity consultant and an indigenous community consultant to ensure that the project met its goals of context sensitive development and public involvement. Context Sensitive Solutions is defined as a collaborative, interdisciplinary approach that involves all stakeholders to provide a transportation facility that fits its setting. It is an approach that leads to preserving and enhancing scenic, aesthetic, historic, community, and environmental resources, while improving or maintaining safety, mobility, and infrastructure conditions. that it involves the lowest quantity of expropriations and indemnifications in acquiring the right of way. in October 2013 to discuss the new roadway. PD-05 Educational Outreach (2/2 points): The Environmental Impact Assessment process incorporated public education and worker education on natural resources, the environment, and fire risks, as required by IDB environmental safeguards. It also included capacity building for the municipalities affected by the road project. PD-06 Tracking Environmental Commitments (5/5 points): The project scored highly under this criterion as tracking environmental commitments is required by IDB environmental safeguards. Paraguay uses an Environmental Compliance Tracking System that involves environmental tracking by the consultant, environmental supervision by the MOPC, and environmental audits from the Paraguayan Ministry of Environment. PD-07 Habitat Restoration (2/3 points): Through the environmental review process, the MOPC selected the alternative with the least impact on protected areas. The MOPC also hired a biodiversity consultant that suggested habitat restoration. Planned projects include restoration of forests in biodiversity corridors located in the Tayai river and support for the creation of nurseries, with endemic species for restoration of biodiversity corridors and commercial purposes. PD-09 Ecological Connectivity (2/3 points): This project is the first road in Paraguay that will incorporate wildlife crossings. The project includes ecological corridors restoration in alliance with Paraguay Biodiversity and the Itaipu bi-national dam, which is the largest dam in Paraguay and is on the border with Brazil. Map of new roadway segment from San Juan Nepomuceno to Tavaí. Staff from the MOPC noted that several of the areas that scored highly on INVEST are areas that are included in Paraguay’s Technical Specifications for Road Projects. These areas include: Context Sensitive Project Development (PD-03) and Tracking Environmental Commitments (PD-08). This mirrors the experience of transportation agencies in the United States. For instance, Arizona Department of Transportation had a similar experience and is working to incorporate additional sustainability items where they did not score as highly, such as Construction Waste Management (PD-29), in their Standard Specifications for Road and Bridge Construction. Additionally, a recent Paraguayan law requires that no less than 1 percent of funding for construction and maintenance of roads should be used to pay for environmental services, such as management, conservation, and recovery of ecosystem functions. Accounting for this law helped the MOPC achieve higher scores in Habitat Restoration (PD-07) and Ecological Connectivity (PD-09). PD-04 Highway and Traffic Safety (0/10 points): Unfortunately, Paraguay does not have quantitative highway and traffic safety data for analysis to create safety plans and target safety investments. As such, the project was unable to gain any points on this criterion. Instead, Paraguay relies on published design and operational performance standards during the project development process. However, the MOPC is working on a project that would start to collect and assess traffic safety data. The full set of criteria and scores appear below, using the Rural Extended scorecard. In total, the project received 32 points on the Rural Extended scorecard, which is only 3 points shy of the number needed to achieve the Bronze level of sustainability as measured by INVEST. The MOPC is considering application of INVEST earlier in the project development process, during the planning and design stage, in order to have greater influence over sustainability decisions. Further, as project construction has not yet begun, there may be opportunities to improve sustainability in the later INVEST criteria which are within the construction phase. The MOPC could also consider revising its Technical Specifications for Road Projects to contain more sustainability elements. Another next step would be to customize and adapt INVEST to the context and needs of Paraguay. The MOPC could also promote its successes in habitat restoration, ecological connectivity, context sensitive design, and other areas to transportation agencies elsewhere in Latin America or in the United States to provide helpful examples of how to achieve high levels of sustainability in these areas. 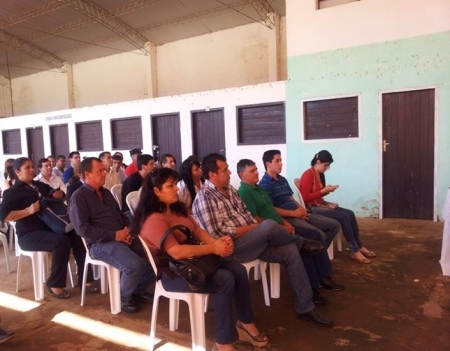 The Paraguayan MOPC gained experience using a well-tested transportation sustainability tool and identified areas of strength and weakness regarding sustainability. The IDB benefited from a test case of scoring an IDB-funded project. This furthers the IDB’s goal of improving the sustainability of the projects it funds and the IDB’s objective of finding or developing a sustainability assessment tool to aid in this process. The Federal Highway Administration (FHWA) benefited from the international collaboration, learning from a project that adds to the diversity of projects evaluated with INVEST. FHWA also benefited from engaging in dialogue with Paraguayan and IDB counterparts on shared sustainability challenges and opportunities.